Interests - Aaron is tube fed. He likes touchy feely and noisy books,, animals, being around other children, watching TV ( Sesame Street is favourite, Teletubbies, Mickey Mouse and Balamory).Listening to all types of music on his ipod. Being at the seaside/ feeding ducks. Things that light up, feeling different textured things like spikey balls, different tabrics etc.Aaron loves anything to do with outdoors, especially woodland & countryside. Visually/hearing impaired? - Yes - Wears glasses due to squint and astigmatism. Suffers from any developmental delay? - Yes - Aaron cannot sit, crawl, walk or talk. Swimming, anything sporty. especially football, supports Doncaster Rovers /Liverpool. Playstation 4, iPad, Horrid Henry, Lego, loom bands. Loves animals/wildlife, Steve Backshall's Deadliest Things. Reading books by James Patterson,David Baddeli, David Walliams. Aaron was born at 39 weeks on the 27th March 2000. He weighed in at 5lb 12oz and he was so little he could fit into his Daddy’s hand. He struggled at first and the doctors had to give him oxygen to help bring him round a little, as he was very drowsy. When he was born the doctors noticed that Aaron had undescended testes, which can be quite common in boys, but they could not be felt higher up at all. They decided that a hormone test and a chromosome test should be done to see what was causing the problem. After an agonising 2 week wait for the result, the hormone test came back normal but the chromosome one came back abnormal. It was explained to us that Aaron had a re-arrangement of his chromosomes, he had too much of number 14 chromosome and not enough 18 chromosome, but as it was such a small amount they didn’t know how it would affect Aaron. The Doctors had not seen this before so did not know what the future held. Aaron didn’t like being fed and because of a very high palette he had trouble eating and swallowing. After battling for 7 years Aaron had a gastrostomy fitted. This was the best thing we’ve ever done as before he was so fragile but after the gastrostomy he put on weight and got heavier and stronger. Aaron suffers badly during the winter months and often ends up in hospital where he is well known. At one point he was going into hospital every six months but now it is just once a year. Aaron will start off with a slight cold but this will get worse and turn into pneumonia requiring IV antibiotics, IV fluids, oxygen and nebulisers and a week in hospital. He does suffer with asthma but this is controlled with inhalers. Aaron also has cerebral palsy. He is unable to sit unaided and is wheelchair bound. He does love to lie on the floor though. Aaron is a very happy boy and loves to interact with other children. Even though Aaron can’t speak he can make sounds. He can wrap anyone around his little finger and always gets his own way. He is such a loveable young man and loves his little brother jumping all over him. In March 2010 Aaron underwent a fundoplication operation. He was not his happy self after and in July had to undergo another operation to loosen the tie off. He is now getting back to his happy self. He has been extremely brave and always comes out at the other end with a massive smile on his face – that’s why we all love him so much! Aaron is doing ok, he’s had his usual chest problems, but luckily with the help of his nebulisers we have kept him stable and out of hospital. He’s recently had a check up with his hips and this is still ongoing and we’ve got to closely watch him and then go back to see the surgeon.This is to see if they will just wait and see if they’re dislocated or if they will operate to put it back into place. He had his eyes tested yesterday and been told he now has cataracts, but no one will do anything about it due to his health conditions. Your post always cheers the boys up and makes them smile. Thank you to all the people behind the scenes who make Post Pals what it is today. Aaron is doing okay at the moment, we are waiting to undergo heart tests as he keeps going into SVT (high heart rate) for no apparent reason, so he has been referred for 72 hour ECG to see if this is heart related or if it’s brain related. We think it may be related to the heat with it being so warm. So looks like it might be body temperature related, like overheating. Fingers crossed tests will confirm this and it’s nothing heart related. We are still monitoring his hip as may need an operation on that in the coming months, but the surgeon asked to monitor him to see if in pain and if we think he is then they will look at operating. Aaron’s had an up & down month, had few appointments regarding different things, one being his hips. We have discovered he had a partial dislocating left hip, he had an operation on his right hip when that was dislocating, so we are expecting it to happen again. We saw the consultant last week and have to closely monitor him for the next couple of months, to see if we think he experiences pain when changing, bathing, moving & handling etc. Then we will go back to the consultant and see if he needs another hip operation to correct the left one. We’ve had respiratory appointments as he has now contracted Pseudomonus again, which he keeps getting over and over again. This is a bacterial infection that causes lots of coughing up some very nasty stuff and a dry mouth. Also in the last few months we have noticed that Aaron keeps having SVT (where his heart rate shoots up) we are now hoping to get in to see a heart specialist to see what could be causing this, as it can last from a few minutes to hours, resulting in 999 call to hospital and then medication to bring it down and back to normal. We thought that maybe it was infection related, but it just seems to be happening more and more. Maybe it’s the Pseudomonus that’s causing it, and he is having treatment for this, antibiotics and nebulisers twice a day. But he always comes out the other end with a smile, and it’s thanks to all your post that keeps us and him going through all these hard times. Thank you from the bottom of our hearts. Aaron is poorly at the moment, just waiting on results to see if it’s just the nasty cold virus that’s been going around or if his lung infection has returned. If the lung infection has returned then it will be a case of returning to the nebuliser with antibiotics for at least 3 months, twice a day! Which Aaron is not a fan of! Also not had great news the last few weeks, went to see the hip specialist and it turns out he now has a left dislocating hip, just like he had with the right one a few years ago, so now the specialist is consulting with the specialist at Sheffield children’s hospital to decide a plan of action. If they leave it and watch it, or go ahead and operate, as it requires an 8-9 hour operation, pin & plates in the hip bone, spica pots on from his waist all the way down to his feet and then the big bar across, for at least 3 months. So we’ve got to return in 3 months to discuss what they have decided to do. So all the post the boys have been receiving has come at the right time to cheer us all up, you don’t know how much it means to us all thank you! Aaron is doing ok, we’ve had appointments with the consultant, been re referred about legs as he’s not happy when sat for long times in a wheelchair so there maybe a hip problem, we’ve also been measured for a new wheelchair. Hopefully he will find that more comfortable. Aaron also had been quite well over Christmas, we had to re start the nebulisers due to the Pseudomonus lung infection coming back, but up to now looks like the treatment is working and no hospital admission is needed. Thank you for all the amazing gifts the boys have received over the Christmas period and the whole year, you guys are amazing. Aaron has been ok. He’s had various tests as we thought the Pseudomonus has come back, but as yet they are all clear, but now the winter has started this is where Aaron does get poorly so we’re trying to keep him wrapped up and warm, hopefully the winter won’t be too bad and we have no admissions to hospital. 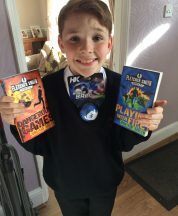 Aaron has received some amazing post this month and it certainly does make him happy & smiley, really does cheer him up after a bad day or when he’s in pain with his hips/legs. Thank you to everyone who has thought of the boys and sent them letters, cards & gifts, it means the world to us all. Aaron has been ok. He got blue-lighted into hospital a few weeks ago, just before we went on holiday as his heart rate hit 220 BPM for around a couple of hours so he had to go into hospital. But when he was in hospital they couldn’t find a reason why this happened, so they put it down to the hot weather. He has been referred to the heart specialist to see if there’s an underlying condition causing this as it does happen every now and again. He had been retested for Pseudomonus as well as we think this has come back again, only been off the nebulisers for 1 month, so maybe a long term medication now. But waiting on the results of that. We had a wonderful weekend in Chessington, was lovely to meet so many of the pals and families. Thank you for the letters, cards & pictures & gifts the boys have received this month, always puts a smile on their faces. Thank you. Aaron has been ok. We have now finished the antibiotic nebulisers, which he has had to have for 3 months due to Pseudomonas infection, which is an infection in the lungs, once you get it you never get rid of it, it stays there but you have to control it. So we have to wait and see if it flares up again now he is off the nebulisers. If it doesn’t then great, but if it does we have to give Aaron nebulisers twice a day every day, over the winter months and see how he goes from there. We went away to the Isle of Wight last week. The week before was very eventful as we were trying to get everything ready, making sure everything was packed up, Aaron decided to spark a temperature when the weather was hot! He then decided that his heart rate was going to spike to a whopping 220. We tried everything to get it to come down, but to no avail. After a couple of hours of his heart rate still going at 220 we decided to call the Drs. for advice, as the hospital usually only give him paracetamol and ibuprofen to get his temp down. So thought I’d ring the GP first. After speaking to them, they advised 999, so 3 days before going on holiday a trip to A&E it was, but as soon as the ambulance arrived and he was put in the back of the ambulance, his heart rate decided to go back to normal. It was as though nothing was wrong with him. Usually it’s the sign of an infection brewing. Luckily, lots of tests were done, but nothing was showing up as to what had caused it, so they observed him for a few hours and prescribed antibiotics, just in case he was brewing an infection and then we were allowed home. He has now been referred to a heart specialist, as this happens quite often when he spikes a temperature, so maybe looking into what can be done to prevent it, whether it will mean an operation or medication, we are not sure!! But when Aaron is feeling low and poorly all your post helps brighten his day. Thank you from the bottom of our hearts. Aaron is still continuing with the antibiotic nebulisers, and has been on them now for a month, another 2 months to go. All seems to be working at the moment, so hopefully things will get better. But if he gets poorly or gets a cold the Pseudomonas will probably return, so he will need to go back on to the nebulisers continuously through the winter. Then see how he goes over the summer months. He is still having problems with his legs and we still haven’t got an appointment through to see our consultant. So we will have to make a phone call on Monday to find out what’s happening. He is constantly needing pain killers to help with the muscle spasm, as he is not too happy sat in his chair for long periods of time. We have had a lovely half term holiday, Aaron has visited the Yorkshire wildlife park with his Grandma and Granddad, where he decided to break his footplate on his wheelchair. Luckily we got it fixed yesterday. He has also been into day respite care, where he spends time with other children and really enjoys it. Thank you for all your lovely letters, postcards, drawings, cards & gifts, they do mean the world to us all. Aaron has had quite a bad month. Firstly he was up most of the nights with a bad cough and chest infection, which resulted in 2 trips to the doctors and two lots of different antibiotics. They didn’t really seem to do much, so we contacted his respiratory nurse who came out and took a sputum sample. I then got a phone call to say he had a bacterial infection, Pseudomonus, which required immediate treatment. We had two options, as normal antibiotics do not treat the infection and the strain Aaron has got is resistant to oral antibiotics. So we had the options of IV treatment in hospital, which would require him staying in for 5 days to 4 weeks, depending how quick it worked for him, or to stay home and have nebulisers twice a day for 3 months. Due to Aaron’s health and how quickly he catches infections, we decided to keep him at home and try the nebulisers. Hopefully this treatment will work and he will not require a hospital stay. Also we are still waiting on an appointment for his legs. His leg trouble has started up again, causing his leg to freeze in certain positions, especially when changing from laying down to sitting up.His legs actually end up in the same position as he has been sat in, causing bad cramps and bad pain. Fingers crossed we can get these sorted over the next month. But he always comes out the other end smiling, I often wonder how he does it!! Thanks to Postpals and all the amazing volunteers who write to us and send gifts. It means so much and does put a smile in our house, cannot thank you all enough. 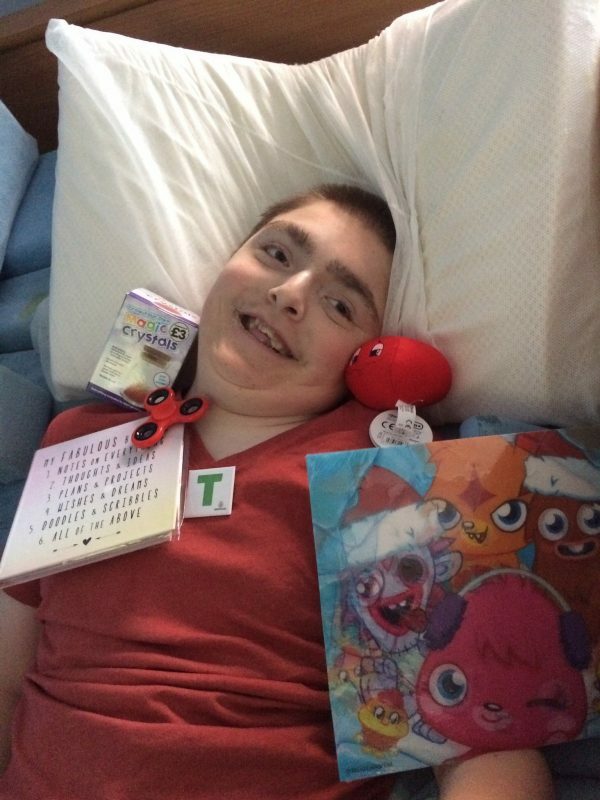 Aaron has had a lovely birthday month, thank you to all who sent cards, letters and gifts! We took Aaron away for his birthday to a lovely place in Northumberland, which had its own sensory room and hydropool. Aaron had a fab time, unfortunately on return he has come down with a chest infection and is on antibiotics yet again, hopefully within the next few days he will turn a corner. His heart rate has spiked a few times, but with lots of TLC he has got through it, but lots of disturbed nights for both Aaron and us. He is now on the correct medications and has started to settle, luckily no hospital admission or 999 calls needed, very close, but managed to avoid it. Again thank you to all who sent both the boys cards,letters and gifts this month.It does mean the world to us all and has made Aaron’s birthday and Easter very special. Aaron has been doing ok, we have had a few ups and downs due to leg problems again.We are waiting for an appointment to see the consultant to see if anything can be done and what could be causing it, as it’s beyond painful for Aaron. He cannot straighten his leg and is currently having to be given paracetamol and ibuprofen at regular intervals. All your cards, letters and gifts really do cheer him up when he is down, and makes him and his brother smile. Thank you, it does really mean the world to us. Aaron has had a good January, he has settled back into the routine of school. But he is still having trouble with his legs and we are still waiting for an appointment to see the specialist. But with the help of his upped dosage of muscle relaxant he is managing well and also his Radox bubble bath is helping. His stomach issues are still on-going, but again with the help of medication this is being managed. Thank you to all who sends gifts, cards & letters, we love reading them all. We are in the process of trying to write back to people who send us post. So if you could pop your address on the letters, cards & parcels, we would love to write back to thank you all personally. Aaron has had a good Christmas, better than last year, which saw him in hospital. We have recently found out that he has lost lots of weight due to his change in feed to help with his ongoing stomach issues. So put him on a gentler soya based feed, but this did not have enough calories, so he has lost nearly 2 stone since July. After talking with the dietician they have changed his feed again, fingers crossed it seems to be working and the weight is slowly going back on. We are still waiting for an appointment to see a specialist regarding leg issues, as he suffers badly with cramp.After speaking with Aaron’s consultant, he referred him to a leg specialist, so he can assess if his hip has dislocated again or if it’s his muscles that are going into spasm. If that’s the case he may need Botox injections or the muscles cutting slightly to relax them.He wakes regularly through the night with the spasm, so hopefully won’t be too long before he gets an appointment. Aaron’s chest has been ok, but we think the 3 antibiotics that he’s on for his stomach are helping with his chest. Thank you to everyone who has sent cards, letters & gifts to the boys, it means so much to us all, from the bottom of our hearts, THANK YOU. Aaron is doing ok at the moment, he has been up and down but mainly with stomach infections.He is now on 3 lots of antibiotics once a month to help keep it at bay, but this has an effect on his bowels, so not nice for him. The dietician recently changed his feed due to his stomach problems and put him on a peptisorb type which is gentler on his stomach. This has caused him to lose over a stone since July, which isn’t good. Now his overnight ventilation is causing him problems, due to it being loose fitting, as he has lost lots of weight on his face.So we had to get the respirator out and have got to order new mask etc. Because it has got to have be tight to keep it working right, it is now causing blisters on his face, even though we have dressings for it. We are hoping to sort his feed out soon, ( I hope) we are waiting for the dietician to get back in touch with us regarding this ,as it can really affect his health if he loses too much weight,as he can’t fight the winter bugs.We also have an emergency appointment on Tuesday next week with our paediatrician, due to Aaron having a lot of pain in his joints. When we lift him out of his wheelchair his legs are so stiff and cramped he screams in pain until we stretch them out and massage them. It can take up to 1 hour for his muscles to relax, hopefully there’s nothing else going on and it’s just a case of upping his relaxant medication and not needing operations for it. Aaron’s not had a great few months and has had lots of tests due to a stomach problem. We’re still not sure what’s causing the problem, but are trying lots of different things to solve it. His gastostromy feed has been changed to see if this is causing the issue (which has slightly improved things), but he’s still having discomfort and bad bowels. We’re back to see the stomach specialist at the beginning of September for test results and the next lot of investigations. Aaron may have to have cameras inside of his bowel to check that everything is okay, but it is a last resort. He has also suffered with his chest, resulting in a chest infection. The respiratory team are now putting him on constant antibiotics to see if this will help and fingers crossed he will have a better month now. Aaron has enjoyed a holiday in Somerset recently. He loved being in the caravan, being by the sea, and being under trees and woodlands. Thank you for all your post and gifts these past few months. It means so much to us (as a family) to still see smiles on the boys’ faces when they have such tough times. Their biggest smiles come from the help of Post Pals and the amazing people who take the time to think of them both. Aaron has been well this last month, though he still had lots of hospital appointments due to him being quite poorly last year. We have had to see a heart specialist, due to high heart rate, to see if they can find what’s causing it to happen. It seems to be when he’s poorly or brewing an infection. They have said they can operate but at the moment it’s too risky, so we have decided to watch and wait to see if it occurs again and then discuss the matter further. We have also seen a kidney specialist, again due to his severe illness last year when he went into kidney failure, and we are still waiting on the results from that test. Aaron is enjoying school and has settled back in well. Fingers crossed now the weather is improving slightly, that things continue and we stay out of hospital until at least the winter. Thank you for all your kind thoughts, cards, letters and gifts for the boys. We appreciate every single one. We do sometimes struggle to reply but are hoping to get through them all in due course, as it means so much to us all. Aaron and Matthew have both had it tough over the last few months. Aaron has had several chest infections from October and never really got over them. He also had his regular Botox injections beginning of December, which he recovered well from, then just two days before Christmas suffered with really high heart rate. This resulted in an ambulance ride to hospital and they had to get it under control with medication. He ended up being in hospital for a week with yet another chest infection, and we spent Christmas Day in hospital. It was not nice for either of the boys, but luckily a week later we get discharged and celebrated Christmas at New Year. Aaron is now on the mend and enjoying settling back into school. Thank you to all of you who sent cards, Christmas cards, gifts etc, it really does make so much difference to the boys and makes them smile so much. We can’t thank you all enough as it means the world to us. Aaron has had an up and down time of it over the last couple months. Now the winter has arrived and the colder weather, it causes aaron so much trouble. He’s had chest infection after chest infection resulting in lots of time off school and he has only done 4 days since the beginning of October. He has had different antibiotics but hopefully now he’s had the right one and has at last started to get back to normality (just about). He is still having a hard time at school and just doesn’t seem to want to be there. I think it is more to do with the fact that he wants to stay home and watch his television. Thank you to all who have sent him and Matthew post as it does help put a smile on their faces, especially when they are not feeling too great. Fingers crossed the weather will not get too bad and we can stay out of hospital. Aaron has had a good few months and he is now back enjoying school. He’s had a few illnesses (one resulting in a near dash to the hospital) but luckily with the support of his respiratory nurse we managed to keep him at home and look after him with the help of his ventilation and plenty of antibiotics. He is usually ok throughout the summer but now the cold weather is setting in and he’s back at school we are just waiting for all the bugs to start appearing. Aaron has had a rough year this year. It started last October having his hip operation and being in pots for 8 weeks, to then this Easter having to be taken into hospital with what we thought was just his usual chest infection. However, the next thing we knew he was being rushed through into resuscitation and alarms were going off and all doctors and nurses were running around. Once he was stabilised he then got taken up to the children’s ward where he was put on oxygen, but things then went from bad to worse. His oxygen levels dropped and couldn’t be stabilised. They eventually got them stabilised, but with every doctor and nurse who was on the ward in the room with us I think – even an anaesthetist was called incase they needed ventilation. The next thing we knew he was being transferred to Sheffield Children’s Hospital by embrace (ambulance service). It was the longest journey ever, even though it was only 30 minutes away. We arrived at Sheffield and when we got outside the doors, Aaron then had an SVT (abnormal heart rate) which went to high 200. We had to run through the A&E department on to ICU, where they were all waiting for him. Eventually, after 2 doses of heart medication, it stabilised. We were called into a side room and were told that he was critical and had had to be ventilated. It turned out he had pneumonia, a bowel infection that had led to septacemia, and he also had really low blood pressure as all his organs were starting to fail. The nurses were fantastic and fought to keep him here. Luckily, 3 weeks later he was well enough to be transferred to HDU, but then came the problem that he wasn’t keeping his oxygen levels up at night. We were told that we may have to consider a trachy but after Aaron’s ENT specialist came to see him he thought he’d try to do a tongue procedure. This consisted of them shaving off the back of the tongue, removing his lateral tonsils, and opening his airways up. After only 30 minutes in theatre he was back on HDU, smiling as always. We were again told that because of the swelling he may need to be re ventilated as this had happened before. The next day he was fine with no apparent signs of distress and none came. The doctors and nurses were amazed at how he’d recovered. Luckily, after 32 days in hospital, we were finally told we could go home!! Since being home he has done amazing well. He’s been so happy and smily until today, as he is a little under the weather but I think it is due to the heat and his brother having cold which he may be coming down with too. Matthew was a star too as it was hard on him with us being away for so long. He stayed with his nanna and granddad and came to stay with us at weekends. The odd time we tried to get home to see him, he was so glad he cried and never left our sides. Now he always has fear that when we say Aaron has to go to hospital, even if just for a check up, he thinks the worse and that’s where all your lovely post and thoughts are brilliant – it makes him feel special and takes his mind off us not being there. All the post we got for Aaron as well was amazing. Especially the massive mickey mouse balloon, even the nurses loved him and wanted to pinch him, despite the fact he did scare them from time to time when he decided to move in the breeze! Just a little update on Aaron. He is still in HDU but now back to his normal self. He is having a small operation today as the doctors think he has a very large tongue and it’s flopping backwards and obstructing his airways. They are going to slightly shave off the back of his tongue. It doesn’t sound nice but it’s meant to be like having your tonsils out. Hopefully this works as the next step is a trachy. Fingers crossed. Aaron is truly a superstar. He’s been sat in his wheelchair for the first time in 3 weeks today. I didn’t think that would happen anytime soon. He is still taking things slowly but gradually getting there and hopefully we can get him home very soon. Thank you to every one of you who has sent post to Aaron and Matthew, we even got a personalised photo from Mickey Mouse. Aaron has now been moved to HDU. He’s doing so well. He had to have his second blood transfusion today, but it’s one step closer to home. Aaron is doing well, he’s now off the ventilator and breathing well. He’s still needing support from his bi pap machine and oxygen, but he’s off the kidney dialysis machine for now to see how his kidneys go. Aaron is still on a ventilator in ICU. He’s on a kidney dialysis machine and they keep turning it off but his kidneys are still not wanting to work so has to go back on it. He’s doing well with the vent so hopefully he may be taken off later. He’s waking up very slowly but there is still a long road to go. He’s on TPN as he has got an infected bowel so can’t be fed at the moment. He’s had a right fight on his hands and at this precise minute he is starting to win this fight. Hopefully he’s still got the strength to fight it and we’ll get him home. Just to let people know Aaron is seriously poorly in hospital. He’s in ICU on a ventilator, recovering from pneumonia and sepsis, which has caused his kidneys to shut down and so is on a kidney dialysis machine at the moment. Lots of things going on for him at the moment, it’s a very emotional roller coaster ride. Aaron and Matthew have both had a tough time over the past month or so. Aaron has had major hip surgery which resulted in him having a 6 hour operation and 2 weeks in HDU, also needing a hip spica cast on his legs, which was removed on Monday and he is now undergoing intense physiotherapy as his leg does not want to work with being stuck in pots for 8 weeks. Aaron is in more pain now than when he had the operation as his muscles have all seized up, but slowly he’s getting there. We are all immensely proud of how he’s coped with the operation and having casts on for 8 weeks, he’s done so well and coped with it all and still come out of it with a smile on is face, he truly is an inspiration. He is also now on Bi Pap machine overnight, so that’s something else to contend with. There’s nothing like being thrown in at deep end, with operation and ventilation, as he has now been discovered as having sleep apnea. He’s not just shutting off his airways but also not taking deep enough breaths and getting rid of the carbon dioxide inside his body so he’s storing it up and causing high CO2 levels and low oxygen levels all at the same time. At the same time Matthew has also coped with it well and is an amazing support to his brother, he never moans and found it very tough while we were in hospital, so the post certainly helped cheer him up. Again thank you so much for all the post the boys have both received, it makes them both feel special and it is lovely to see so many people care, it is so heart warming. Thank you is just not enough to express how much you all make them smile. Thank you to all who sent Aaron and Matthew cards this month as they have both had a hard time of it with Aaron having major surgery and the cards made them both feel special. Thank you for all the letters received, each and every one gets read out to Aaron and the boys love hearing what you all get up to and where you have visited. It’s amazing to hear all your stories and to share them with us is truly heart warming. Thank you for all the lovely gifts received, as Aaron spent some time in hospital they really cheered him up, from music cds to dvd’s, to even receiving a funky pigeon, who sat on his hospital bed to keep him company along with a Mickey Mouse. The gifts certainly got him through a very tough time. What a roller coaster of a month we’ve had. Firstly, we got a date for Aaron’s hip operation, so were all geared up for it, only to arrive at hospital to be told there was no bed for him. Then, after few changes, they decided they did have a bed so the operation would go ahead. Off we went to theatre to then discover Aaron had a very high temperature, so the operation was cancelled. He was admitted with a chest infection though, so the operation will hopefully be happening in the next few weeks. So, now we’ve got to prepare ourselves yet again, as we now know more about the operation and are not looking forward to it. Aaron’s got to go into HDU for as long as needs be due to the operation being quite major and it can lead to blood transfusion. He needs an epidural for pain relief and also a catheter fitted, and it’s going to be a long recovery period for Aaron. At the moment he’s just getting over his chest infection but doing it in true Aaron style, with a smile. Aaron and Matthew have enjoyed receiving all your lovely cards and postcards, you all have created lots of smiles in our house. They have loved hearing all about what you all get up to in your letters, again lots of smiles created. Thank you from the bottom of our hearts for all the lovely gifts the boys have received, from DVDs and audio books to fuzzy felts, they do make the boys feel very special. Post Pals is an amazing charity with wonderful people and we cannot thank you enough for the smiles they have given my boys. Aaron’s had a good couple of months, he does suffer badly at times with choking but that is controlled with suction and medication. We are awaiting an appointment for his hip operation which will happen early August, which we are not looking forward to. Aaron will be in spica casts for up to 3-4 months depending on healing and recovery, so its going to be a very difficult time for him. Thank you for all the cards and postcards received for Aaron and Matthew, they love hearing your stories and where you’ve been and what you’ve all seen. Thank you for all the letters received for the boys, they all get read out to Aaron and he loves hearing all about you. Thank you for all gifts received, Aaron and Matthew love receiving them and appreciate every one of them. Aaron has been up and down this month, he still seems to be having problems with his stomach, and is not tolerating feeds very well for a few days then he springs back. Hopefully we will have more answers when go back to see the stomach specialist on Tuesday to see whether he has still got the bacterial infection. We are still awaiting a date for the hip operation which is happening in August sometime. We are looking forward to hopefully getting to the Post Pals party this year and meeting up with Post Pals themselves and the senders of post. Thank you to everyone who sent the boys postcards, they love looking at the pictures and reading all about your travels. Thank you to everyone who sends the boys letters as each one gets read out to Aaron and lots of smiles are created by these letters. Thank you to everyone who sends the boys gifts to as they love each and every one of them. Aaron has had it tough this year up to now. After discovering he has helicabacter infection, he has now finished all treatment and it has made him so much happier. We don’t know how he’s coped with it for so many years, it must have been extremely uncomfortable for so so long. He still has symptoms from time to time but not half as bad as he did. We are now awaiting an appointment for major hip surgery as he has a partially dislocated hip, which should be happening around August time, which will leave him in spica casts for up to 8-12 weeks. Something we are not looking forward to! It will not be nice for Aaron as he likes to kick and move his legs and has just figured out how to push himself if he digs his ankles into the floor. We would like to thank everyone who sends the boys cards/postcards – each and every one gets read out to Aaron, they do make him smile so much. We would like to thank every one who sends the boys letters, they do brighten their day and make them smile and feel special. We have had amazing gifts this month and they do make the boys feel very special and thought of so much, it is amazing to think so many people understand and care, thank you is not enough for the kind people from Post Pals. From the bottom of our hearts we say a very big thank you, Aaron has had it tough this year so far and it is amazing to know so many people care. Aaron has had it quite tough over the last couple of months, he has undergone various operations and tests, including botox injections in mouth to help with excess salvia and choking, also botox injections in leg muscles and had hip investigations which is requiring major surgery in August time, meaning he will be in spica casts for up to 3 months and will be fully housebound. Also, he has had camera investigations into stomach and it has been discovered that he is suffering from helicobacter infection causing bad stomach cramps and sickness with every feed. He has been put on yet more medication, had 2 week course of antibiotics which made such a difference for him as the specialist told us he has probably had this condition since pre school age(!) and it has never been picked up before!! Aaron then stopped the antibiotics which made all the symptoms return so has been put on another 2 week course to see what happens this time. The 2 weeks of antibiotics should clear it up, but as yet that hasn’t happened. Aaron and Matthew enjoy reading all your cards and postcards and stories of what you all get up to! They both love all the gifts they receive too, they make the boys smile so much. It is so nice to know there are so many lovely people out there. Keep up the fantastic work Post Pals! Aaron has had a tough couple of months, he has been having lots of investigations to find out why he’s struggling to take his feeds and why he is not quite himself at the moment. He seems to be constantly in pain and was admitted last week for a colonoscopy and also a camera down his throat to assess if anything going off inside. They have discovered inflammation of the bowel and have prescribed 6 weeks steroid medication. We are due back at the consultant on 8th January for all results, then back to hospital on 18th January for botox injections to his legs and maybe a hip operation (depending on pre-op assessment on 8th January). However, all the post the boys are both receiving are making them feel very special and helping them to cope while in and out of hospital. Aaron enjoys all the cards/postcards that he receives, he loves looking at all the cards/postcards from all over the world and Matthew loves receiving them too. Aaron has enjoyed each and everyone of all your letters, all get personally read out to him one by one and he loves to hear all the stories and all the adventures that everyone gets up to, as does Matthew. Aaron and Matthew have also both enjoyed all the gifts that they have received, from all over the world. Aaron has been up and down health wise. He made one day back at school after the summer holiday, then has been off the rest of the week poorly, but luckily is back to school tomorrow. He was supposed to be having Botox injection into his leg/thigh muscles through the summer holidays but on our admission to hospital was told 3 hours later after they had him all ready for theatre that he was too high risk to operate. Now we’ve got to wait to see which consultant is brave enough to do it. I wouldn’t mind, but he’s had loads of anesthetics before and he does have a bit of bad time with them, but they should have already got his notes and been made aware of this. So now we’ve just got to wait until his surgeon comes back from his holidays to see where to go from here. In the mean time Aaron has to suffer in pain waiting to see when he can have these injections and also assessment for major hip operation. He also undergoes botox injections to his salvia glands every 6-8 months which again is by general anesthetic, but it really helps him as he tends to choke on his secretions when getting ready for more botox. Mind you, last time they gave him too much and made him too dry. We are also seeing his gastro surgeon on Tuesday as he is having a few problems with tube feeding at the minute. He always seems to be struggling to keep his feeds down and can become very poorly quickly, it is like a stomach bug which he never seems to get rid of and reoccurs every couple of weeks. We have to knock his feeds down or starve him for 24 hours to help him, but it is happening too often at the moment so we’re going to see if they can do tests to discover what is happening, if anything. Aaron did enjoy going on holiday in August to Norfolk and was really well while there. He enjoyed going for a day out on a wheelchair boat that we hired! He also like laying and relaxing by the pool, even going for a swim which he loved. Aaron and Matthew both enjoy receiving all your cards/postcards etc, each and every one gets read out to Aaron and they produce lots of smiles!! They also love receiving all your letters and hearing what you all get up – Aaron loves listening to us tell him all about your letters and again it produce lots of smiles and even giggles. All the gifts that the boys receive are truly amazing and they love each and every one of them, thank you. Aaron has had some down times lately due to infections, stomach bugs etc, and we have recently been to Sheffield for sleep study results too. He has to have them repeated in the next couple of weeks due to lots of coughing during the night, so has been put on a 4 weeks course of antibiotics which has caused stomach upsets. He then has to be reviewed to see whether he needs more antibiotics or whether the cough has subsided. At the moment the cough is still there but seems slightly better. Before Christmas he had small operation to have botox injected into his salvia glands to help with choking, which has worked successfully. He did have a bad time in the operation due to sats dropping throughout the operation, but hopefully this will last another 6 months before having to go through it again. 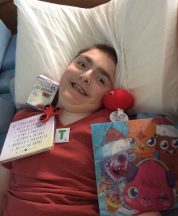 Aaron has enjoyed receiving all your cards and postcards – as he has been quite unwell throughout this month with various bugs etc, the post has made him smile lots. Thank you. Aaron has loved receiving all your letters too and hearing all your news and what you are all getting up to. As he unable to read himself, every single letter gets read to him and he always smiles. They do really brighten up his day. Aaron has loved receiving all your gifts – from Mickey mouse stickers, to wall stickers for his bedroom, gelli-bath and upside down mirror which he loves looking at things upside down with!! He always has a smile when receiving gifts. A very big thank you to everyone who sends the boys post, you put a huge smile on both their faces. Aaron has not had too many chest infections as yet, but as the cold weather approaches we’re just waiting for them to arrive. I’m hoping that he’s going to have a happy Christmas, as he has not had a very good one for the last 2 years and has ended up in hospital shortly afterwards. In October he underwent surgery for Botox injected into salvia glands to help with his secretions. His oxygen levels were also dropping throughout the night, so while he was under anaesthetic they were going to do an endoscopy of his nose and throat to check his adenoids, to see if were obstructing his airway in any way. The surgeon did mention he would like to do an endoscopy while he is awake, but I don’t think that will happen, as no way can Aaron have it done while awake as he won’t keep still enough!! When he came out of theatre Aaron decided to have trouble breathing which scared not only us, but the surgeon and anaesthetist too. He was making a really funny noise and they first thought that his windpipe had collapsed and were all poised to intubate him, but luckily he decided to start behaving and didn’t need the tube down, to the relief of everybody!! He recently had an appointment for his hips. We have been visiting clinic for a couple years now and his hips are getting worse as his right hip is displacing from the socket. He has been having x-rays on it for months now and the last time we went (3 months ago) there was talk that he will eventually need an operation to put it back into socket. This time at clinic, there was no change since the x-ray 3 months ago, so we’ve decided to leave alone at the moment and go back in 6 months. We’re dreading the day they say he has to have it done, as it doesn’t sound very nice, but we’ll cross that bridge when we get to it. We have been to visit Santa a couple of times which Aaron just loves – think we’ve only got another 3 to see! Aaron loves going, he has the biggest smile! Fingers crossed we have a good Christmas and Aaron’s health lets him enjoy it for the first time in few years. We want to see those big smiles on Christmas day Aaron!! I’d just like to thank everyone from the bottom of our hearts for all the cards/postcards/letters and gifts that the boys receive, it really means so much to all of us. Thank you to all who send Aaron and Matthew cards/postcards and letters too. They love listening/reading what you all get up to, and where you’ve been on holidays etc. They really do mean a lot to us all and make the boys smile and feel special. Thank you also for the gifts received, they love the gifts that come, from balloons, drawing/writing things, puppet making, story books/musical books, it does brighten their day when they’re having a bit of a rough time. I think Post Pals is such a wonderful site, Viks and the team of volunteers deserve a special award as the dedication they put in is incredible. Just one last thing – we wish you all a very HAPPY CHRISTMAS!!!!!! Aaron had a rough start at the beginning of the year and was very poorly with pneumonia, but he has now got over that. He’s had a bad time since Christmas with bad chest infections/tummy bugs and he seems to just get over one thing then gets another. We have enjoyed trying out a new bike which we hired from our local wood; it’s a bike where you wheel Aaron on to the front of the bike. He thought it was amazing as he loves going under trees and through the woods. Aaron’s recently had a hip appointment as his hip is starting to slip out of the joint. We were told at this appointment that it has got a lot worse over the past 6 months. We’ve got to go back in 3 months and if it’s still looking like it could slip out and cause dislocation then it will have to be operated on. We’re hoping it’s not too bad when go back but it’s not looking good. Aaron’s also had a sleep clinic appointment and an overnight study done. We’re still awaiting results but were told lots happened with him, so it’s looking like he may have sleep apnea, but it could be up to 4 weeks before results are totally in. He’s also got an appointment at Sheffield Children’s hospital next week as he’s having trouble with secretions again and it is causing him to choke quite badly. It’s also upsetting his stomach, so is causing lots of retching with his gastostromy feeds. Hopefully he can have another dose of Botox in his salvia glands, as it helped when he had it 6 months ago. He still manages to smile in between all this, especially when your letters / cards/ gifts arrive. Words cannot express what a wonderful thing Post Pals is and how wonderful people are. Aaron amazes us all where he finds his inner strength to keep smiling. Aaron and Matthew love receiving post and hearing from you all and what you get up to. Sorry if we haven’t written back but we are in the process of returning letters, they are a bit delayed at the moment with Aaron being poorly, but the letters always make the boys smile. Thank you to all who send Aaron and Matthew gifts too, as they love receiving them. The smiles on their faces when receiving any mail just makes our day, and of course the boys. We’ve enjoyed making solar systems, sock puppets, sticking stickers, Mickey Mouse glow in the dark stickers (which we are saving for Aaron when he has his bedroom decorated in Mickey Mouse). Post Pals is a wonderful thing, it’s so nice to know people care, and Viks and the team do a fantastic job. Aaron had a bad start to the year. He was really poorly over Christmas and didn’t even open his presents until January as was just too poorly. He was admitted to hospital on New Years Day as his oxygen was in its low 70’s. He had blood tests taken to find what was wrong and it was suspected that he had developed pneumonia. He was on iv antibiotics and was in hospital for just over a week. He is well known on the ward and all know his name. It took him a while to get back to normal, as it always takes him a good month to completely recover. We then had a good run with Aaron. When he was in hospital his oxygen levels kept dropping to low 40’s at night, so we have now got to go into Sheffield hospital overnight for sleep apnea testing, which is happening on 2nd August. In May we went to Mexico with Aaron’s grandma and granddad. There were 11 of us altogether and we had a great time. We went on a pirate boat with Captain Jack Sparrow and Aaron was allowed on first to meet the pirates and have his picture taken. We also went swimming with the dolphins, which Aaron loved and he smiled the whole time. Aaron suffered quite badly on the flight home as it was a night flight and he got a lot of cramp in his legs, but he finally fell asleep across me. He went back to school then came down with a sickness bug, so had more time off school. He was just about to go back to school then he came down with a chest infection, so more antibiotics. Aaron was off school for about 2 1/2 weeks in total. He is now finally back to school and enjoying it. When he is poorly your post just brings a smile to his face, he loves receiving all post. It is wonderful how you all send post to Aaron and Matthew also gets excited when he receives post – they can’t wait to open it! I would like to thank everyone who sends Aaron and Matthew cards/postcards, as they love receiving them from all over the world. It does really brighten their day reading happy news about what you are all up to. The cards really do make them smile. Again, thank you to all who send Aaron and Matthew letters, they love reading all your stories and places you’ve been. They love receiving Dottie the Dalmatian stories too. Thank you to everyone who has also sent gifts, they love opening them, the excitement on their faces is indescribable. It’s lovely that Matthew gets gifts too as when his brother is having bad days and is poorly it makes him feel special. You don’t know what that means to us as a family. Thank you to all for Aaron and Matthew’s lovely cards, letters and gifts, especially their Easter gifts, it really does brighten their day. Thank you to everyone who sent Aaron cards, letters and birthday wishes, as really did make his birthday special. Aaron loved the pom pom – huge thank you!! He is poorly at the minute with a sickness bug which hopefully won’t last long. Thank you to everyone who has sent Aaron and his brother post. Thank you also for the birthday cards for Aaron, he’s had a fantastic day. He loved watching Disney on Ice at Sheffield. Thank you again to everyone who made Aaron’s day very special.